$2,350,000 This beachfront home known as "Leapin' Lizards" is well appointed with 7 Bedrooms and 8 Bathrooms overlooking Elbow Cay's most beautiful stretch of white sandy beach. The layout offers multiple living quarters making it ideal for just a few people or a large family group. Lush and private outdoor living areas invite fun and relaxation at poolside on one of the many hardwood sundecks or beachside on a magnificent four posted daybed overlooking the Atlantic Ocean. Within the multiple indoor living areas you'll find three separate kitchen areas and three laundry areas making it easy to access amenities from anywhere on the property. The property is also within walking distance to grocery shopping and a beachside restaurant and just a few minutes from historic Hope Town Settlement by golf cart. "Leapin' Lizards" is nicely landscaped with many mature coconut palm trees providing much shade and an idyllic island vibe to the property's main entryway. "Leapin' Lizards" is also a popular vacation rental with an impressive rental history. 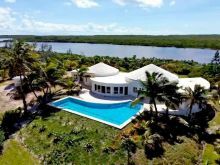 $2,300,000 This spectacular, move-in-ready 4-bedroom, 4.5 bath residence with 4 full en-suite baths is located at the heart of The Abaco Club on Winding Bay. The inviting and open floor plan has a spacious living room, dining room and gourmet kitchen that is equipped with high-end stainless steel appliances and custom cabinetry. A large island invites you into the space and the views make you want to stay forever. The house offers privacy and tranquility especially when you are lounging on the back deck enjoying your morning coffee or in the late afternoon as you watch the magnificent sunsets that always fill the sky with shades of red, pink and orange. Grill the fish you caught earlier that day on your BBQ and enjoy your meal at the large, round, outdoor teak dining table on the spacious covered deck that looks out to Winding Bay. Exceptional features of the residence include: four large bedrooms each with en-suite full bathrooms, a large open plan great room that has been professionally decorated with luxurious fabrics and beautiful furnishings. $2,300,000 Majestically located on a gentle green hill, surrounded by tropical palm trees and offering incredible panoramic views, this modern and stylish beachfront home is one of a kind. Meticulously upgraded and maintained over the years this architecturally noteworthy home has stood the test of time and will continue for generations to come thanks to sound structural engineering and quality construction. A bright and sunny living room area is located in the centre of the home and is flooded with sunlight from an abundancy of large ocean facing windows, offering views of both sides of the island. From here walk directly through to the dining room which features a unique curved wet bar area which faces directly into the kitchen. The positioning and well-appointed nature of the chef's kitchen makes it a delight for cooking and entertaining with comfort and ease.The entire home is professionally decorated with great attention to every detail, offering the very best in luxury and comfort in Eleuthera. $2,300,000 Enjoy effortless ownership of a brand new, historically inspired 3b/3b waterfront villa. Chic, tropical, with all the modern conveniences and private dock for a 55' boat at your front door. The creative dream team includes Cronk Duch Architecture of St. Augustine, Amanda Lindroth Design of Palm Beach, & one of Hope Town's best builders, Abaco Construction Ltd. Renown coastal designer, Amanda Lindroth is famous for her "luxe, low-key rooms that are the epitome of tropical chic". Her style is "comfortable, breezy, and strongly influenced by classical architecture and proportion". Construction is traditional Bahamian loyalist-style, built to the highest standards. Details include cedar shingles, Andersen impact windows and doors, wood floors, high ceilings, ship lap walls, chef's kitchen, underground utilities and full back up generator power. Whether you are in residence, or while your villa is rented, the resort will ensure that every aspect of your property is professionally managed and well maintained. Owning a home on Elbow Cay has never been so easy! Move in date: June 15, 2019. $2,300,000 Located within Ocean Club Estates, this coastal inspired residence has a customized floor plan that sets it apart from other residences. A sun filled open plan living room with beautiful limestone flooring leads on to a terrace overlooking the marina and Nassau harbour. A spacious eat in kitchen with center island, beautiful granite counter tops, gourmet appliances, is ideal for entertaining. The spacious master suite has an en suite bathroom with custom vanity, granite counter top and jetted tub, and a large walk in closet. There are two guest bedrooms with en suite bathrooms and hardwood floors and a family room that can be converted to a fourth bedroom or office. Owners have private access to on site amenities that include a private marina, swimming pools, a fitness center, on site concierge, underground parking with 24 hour security to enhance privacy, as well as membership privileges to a private beach club, golf course, access to amenities of Atlantis resort and dining and spa services at The Ocean Club, a Four Seasons Resort. A 45ft dock slip is also available for purchase. $2,295,000 Welcome to The Reef Residences, the only residential beachfront opportunity at Atlantis, Paradise Island in the Bahamas. Here you can relax and play like nowhere else in the world. The Reef is a luxury high-rise condominium/hotel located at the incredible Resort that is Atlantis! Wake up each morning to the sunrise of the pristine Paradise Beach. The Reef's elegant suites are offered fully furnished from linens to tableware and feature a wide array of custom interior amenities such as crown molding, granite counter tops, fine European kitchen cabinetry, top of the line appliances, luxurious bathrooms, plush wall to wall carpeting, LCD flat panel TV's and a Bose stereo system. Owners of The Residence at Atlantis (The Reef) have exclusive access to their own private gym, a Starbucks Cafe, conveniently located in the lobby and an owners concierge team available to assist with everything from dinner reservations to in-house massages and cocktail parties. Other amenities include the Mandara Spa, Cove Pool,22 on-property restaurants, Marina Village and the Casino. $2,280,000 This beachfront home offers modern living at its best and endless enjoyment on one of the finest beaches New Providence has to offer. Nestled along Cable Beach, this sprawling 4,500 sq. ft., two story villa provides fantastic ocean and sunset views and consists of 4 bedrooms and 4.5 bathrooms with 2 living rooms, open living and dining plan and an office. The detached double car garage has a laundry room and outdoor bathroom along with a bonus upstairs apartment- perfect for a maid or in-law quarters-or ideal income potential. Beautiful private residence or an investment property offering exceptional rental income potential and qualifies for Bahamian Permanent Residency application. Located within a 10-minute drive from Lynden-Pindling International Airport. $2,250,000 Here is a cut, polished emerald which needs the perfect setting to complete the piece. Palmetto Beach Resort is a turnkey operation ready to open its doors and realize its full potential. It has transferable Hotel Encouragement Act entitlements with a total of 7 bedrooms, 10 bathrooms, beach-side pool, 4 kitchens and endless possibilities. A minimal additional investment could increase the beds to 20 then add in a restaurant to round out the business model. Located in the pristine area of Turtle Rocks in Central Abaco. Conveniently located just 10 minutes away from Treasure Cay and its world renowned beach, airport, medical services and sundries. Tap into the existing Marsh Harbour or Treasure Cay tourism markets or create your own. The setting is perfect and the views exquisite, all on a private secluded beachfront compound. Short ride to Marsh Harbour or Baker's Bay on Great Guana Cay. Each villa is either new build or extensively remodeled to the luxurious standards. The 3.7 acre property anchors 205' of white, powder sand beach, 4 beautifully furnished villas. $2,250,000 Bahamas perfection. This highly sought after luxury hilltop residence is located in the Love Beach district of Nassau. This is a wonderful family retreat with a commanding view of the ocean from nearly every room in the house, along with beautifully terraced gardens, a swimming pool landscaped as a private tropical oasis, a modern kitchen with granite counters and stainless steel appliances, updated bathrooms, and gorgeous living spaces for relaxing or entertaining inside and outside - this home truly has it all. This property is available for viewing now and will not last long!